Sorry I'm so late with the newsletter. It's been a busy 2 weeks for me. The week after the quilt show there was stuff to put away and other stuff to get caught up on. The first week of October, Mom took most of the week off to clean caught up on cleaning the house and getting some projects done. 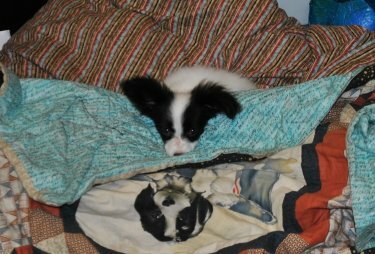 She said most of the cleaning was going behind me and my doggie sisters. I did come into the Shop a couple of days to keep an eye on Grandma & Moda. Enough about me, on to the Shop News. 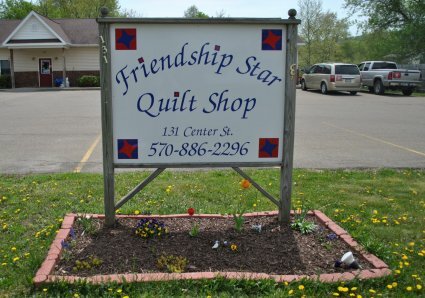 We would like to thank everyone for their support at the Endless Mountain Quilt Guild Quilt Show. Mom says we had many visitors to our booth down there. We had many visitors at the Shop on Saturday, as well. I got lots of attention and had great fun greeting everyone. Congratulations to Barbara Quick for winning our Raffle Basket we had at our booth. We would like also thank everyone who came to our Free Demo & Pattern Day and to the Hiawatha Quilt Guild for including us on their Shop Hop on Saturday. We hope everyone had fun. We sure had fun having all of you visit our Shop. 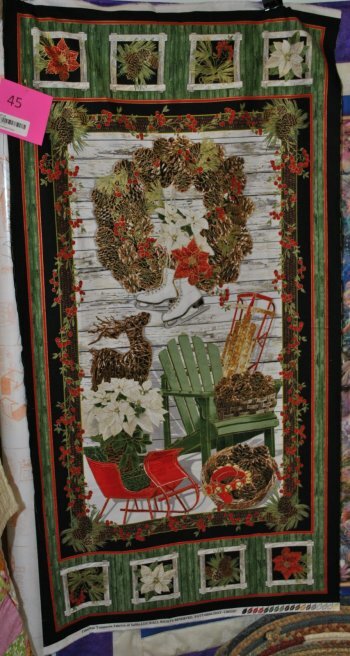 We have a couple of new Christmas & Winter panels that have come into the Shop. 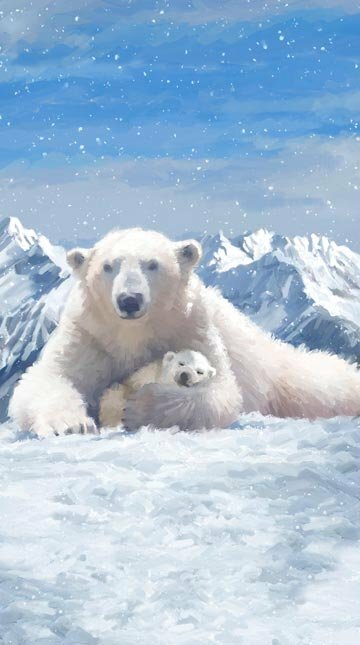 We have Northcott's Mother Polar Bear and Cub in Flannel with a coordinating Northcott flannel fabric. We have a few other fabrics that would go really well with it, too. Isn't this just adorable? It would make a great Winter throw or baby quilt! Wouldn't this look nice as a door wall hanging? 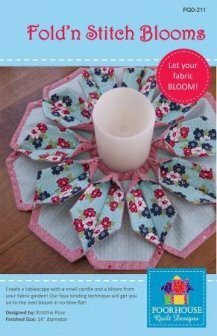 We also have the newest Fold 'N Stitch pattern. 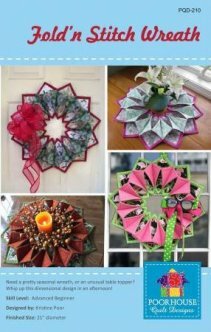 We still have the original wreath and leaf topper patterns as well. We also have the precut In-R-Form stablizers for each of the patterns. Stop in for a visit and check out these and other new products in our Shop! Moda's not here everyday but she's starting to come in more often. So if you haven't met our latest greeter, stop in and meet her. I'm in charge of her training as a greeter. She's learning pretty fast how to be a good greeter. I've told her that customer service is an important job and we have to make everyone feel welcomed. 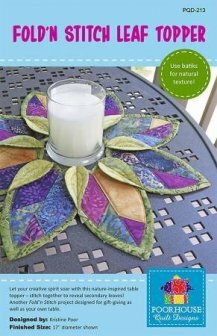 The sewing repair man, Jack Sutliffe will be here Thursday, October 13th from around 10:45-12:00. He prefers checks. He DOES NOT take any credit or debit cards. We highly recommend you use address labels, add your telephone number on your machine, foot and power cord to identify them in case they get separated. DO NOT BRING ANY EXTRA ACCESSORIES EXCEPT AN ATTACHED PRESSER FOOT. We don't want anything to get misplaced. We do have a policy that all machines must be picked up within five (5) days of finished cleaning and/or repairs. All machines that need cleaning only will be ready the same day. 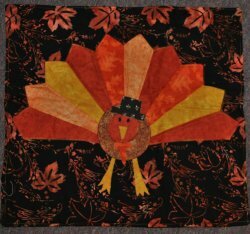 runners, wall hangings or napkins. 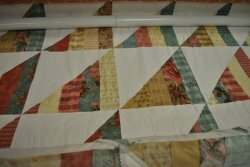 finished, everyone will think you made a hard to make quilt. wall or table this Thanksgiving. 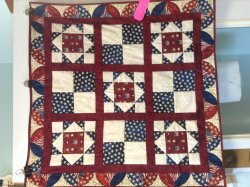 Saturday, November 12th: Free Pattern and Demo Day Learn a new quilt block and get a free pattern, too! The weather is getting cooler and the leaves are turning into they're brilliant farewell celebration. 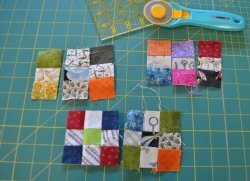 We're starting into Quilting Season once again. I think I have covered everything that's happening in the Shop. Keep your tail high in the air and wagging.